Great Subaru Levorg car Leasing & Contract Hire Deals. Subaru's Levorg (the name derived from 'Legacy', 'reVOlution' and 'touRinG') is the spiritual successor to the brand's fourth generation Legacy estate that ceased production in 2008. This car's a little smaller than its predecessor thanks to underpinnings from the brand's Impreza family hatch, but it still manages to offer more interior space than any old Legacy model served up. And, as with all Subarus, there's the usual stout build quality, peerless reliability, dependable 4WD system and charismatic Boxer engine. Our Subaru Levorg Lease Deals. Subaru is well aware that this Levorg will be a minority choice in its segment but knows that for a select few loyal customers, it will hit the mark precisely. These people will get a charismatic, spacious estate with strong performance, high levels of standard equipment, good residuals and the best 4WD system in the business. In other words, a car of many talents. True, it's nothing like as efficient as most rivals, even if you look at them in petrol form. But Subaru will doubtless address this issue in future with other engine options. For the time being though, the Levorg remains a rare but quite appealing choice in its segment. If you're happy with petrol power, have a £30,000 budget and don't want an SUV - or an estate car trying to look like an SUV - it may be just up your street. Subaru is the master of the tough four wheel drive estate. Today, its range offers that recipe either in tough, SUV-like Outback model guise. Or in the form we look at here. Enter the Subaru Levorg GT. The Fuji Heavy Industries brand needs the Levorg. Not everyone, after all, wants the offroad look championed by the company's Outback model but quite a few buyers might like Symmetrical All-Wheel Drive allied to a sportier, more dynamic car more targeted at tarmac territory, yet well capable of dealing with a snowy snap. The mechanical package is interesting here too, though unfortunately, it doesn't yet include diesel power. If that's not a problem, then there's plenty else to like, not least excellent levels of interior practicality. Those looking for a more interesting option to upper-spec petrol-powered Mondeo estates - maybe cars like Volvo's V60 or the Mazda6 Tourer - should read on. Subaru are using the Levorg GT to introduce an all new 170PS 1.6 litre DIT (direct injection turbo) four cylinder boxer engine coupled exclusively to a Lineartronic CVT automatic gearbox with six simulated ratios. Power is slightly below the older 2.5-litre naturally aspirated flat four that the brand used to offer in this class of car, although the torque output is higher. This sole engine and transmission combination gives a 0-62mph time of 8.9 seconds and a top speed of 130mph. 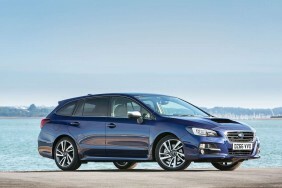 Subaru says that it's benchmarked this car against its performance models and it certainly should provide a more dynamic drive than you used to get from the old Legacy Tourer. Ultimately though, this isn't an out-and-out performance-minded estate car, something you could have guessed by the standard provision of CVT belt-driven auto transmission - there's no manual gearbox option. This won't be quite as smooth as the latest dual clutch systems you'd find on many rivals. Still, handling should be quite sharp, aided by this model's very low centre of gravity. Thank the low-mounted Boxer engine up-front for that. The Symmetrical All-Wheel Drive system is also of the permanent kind, rather than the sort of 'on-demand' set-up you'd get in rivals like Ford Mondeo or Volkswagen Passat estates. So you'll be better provided for in terms of traction. The Levorg GT looks a potent thing with its menacing headlamps and deep front bonnet scoop. It's also very space-efficient, as you'll discover on taking a seat inside. Despite a platform derived from that used by Subaru's smaller Impreza family hatch, there's more cabin space than there was in the apparently much larger old Legacy Tourer. There's plenty of room for up to five passengers and a decent 522-litre boot capacity. Fold the seats down and this increases to a useful 1446-litres. Up front, the driver faces a neat instrument binnacle, while the centre console houses a touch screen infotainment system that's much better than anything Subaru used to offer. Build quality is another thing that's surprisingly good too, though it still isn't up to the quality you'd expect from the smart German brands. Plus of course, there's lashing of standard kit. UK buyers get one very plush GT trim level with a single powertrain choice. The price is around £27,500, which pitches this car against top 4WD estate versions of Volkswagen's Passat and Ford's Mondeo. So what do you get for your money? Apart from the standard-fit automatic gearbox, included equipment runs to leather-trimmed sport seats, keyless entry with push-button start, air conditioning, Bluetooth phone connectivity for the 6.2"" infotainment system, cruise control, auto headlamps and wipers and 18-inch alloy wheels. Safety-wise, apart from the usual electronic aids, there's a blind spot detection system to stop you dangerously pulling out to overtake in front of another car. And a rear vehicle alert set-up that warns you of approaching cars whilst reversing. In evaluating this car, you need to make sure you're comparing apples with apples. If you're putting the Levorg up against a diesel estate rival, then this car's returns - 39.8mpg on the combined cycle and 164g/km of CO2 - will seem rather high, particularly if the model in question is only front-driven and has a manual gearbox. Remember though, that with this Subaru, you get proper Symmetrical permanent AWD, an auto gearbox and a petrol engine and the running cost returns seem more acceptable, particularly as you'll be using cheaper green pump fuel. There's plenty of peace of mind too. Subaru should be commended for their five year/100,000 mile warranty - something many other manufacturers would charge extra for or not offer at all. Reliability has always been a strong Subaru selling point, although servicing is likely to be pricier than some of the competition. Subaru residuals are stronger than you'd think, thanks to strong demand.